@LG: Let's not forget 2005, when they were title rivals. Great season and Raikkonen was unfortunate with retirements. @MelhemSakr: Nope. The test was so Honda could record the first mileage on its new power unit. For obvious reasons, Honda wasn't singing about how the test session went. 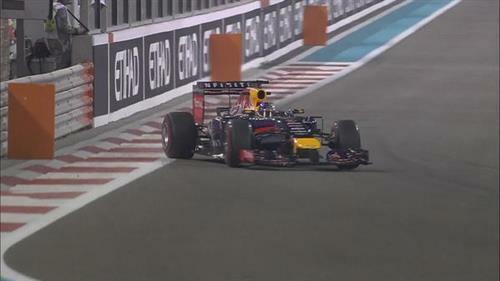 Good save that from Vettel. There's only one driver in F1 as good as Alonso and that's Hamilton...maybe. Hamilton and Alonso certainly seem to be a lot more adaptable to Raikkonen, judging by how he's been in 2009 and this season. We're into the final 25 minutes of this session. Massa and Perez now emerge on soft tyres for long runs on the prime tyres. Maldonado has a moment and runs wide. Kobayashi missed the apex at Turn 9. A few drivers starting to struggle on the super soft tyre. @Marco: Button had an issue this morning and took about 25 minutes to emerge, so he's down on mileage compared to those around him. 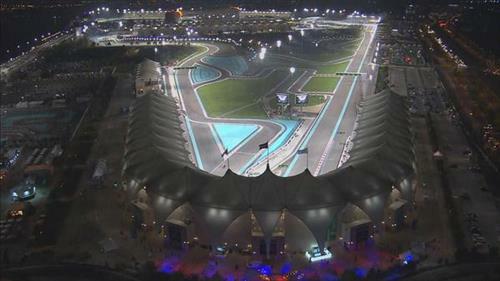 The Mercedes drivers are currently lapping around nine tenths quicker than Bottas on their super soft long run. @Supreetbhat: Back in the garage. His session ended with a gearbox issue in the first few minutes. So Nate, what is your prediction for how many tyres the team's will have for the race? @RogertheCabinboyCrete: Hard to guess right now. Degradation doesn't seem to be a massive issue at the moment, even with the softest compounds, so perhaps a two stop race. Merc pace is ominous. Their lack of deg and consistent lap times are ironically going to hurt Rosberg more than Hamilton, if this continues since it will mean the possibility of Hamilton finishing anywhere outside the top 2 near impossible. 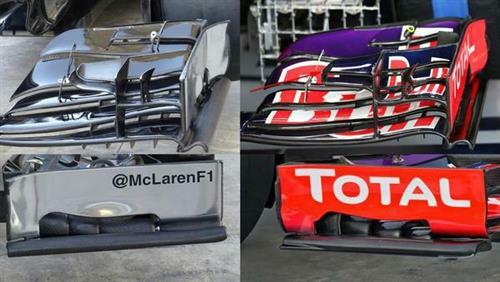 That on the left is the 2015 McLaren wing, designed by ex-Red Bull technical guru Peter Prodromou. Force India tells Perez it has no concerns over the rear tyres and that he can push as hard as he likes. Nate, do you think SFI can bring atleast one of the cars into Q3? @f1f: I think it looks unlikely at the moment, to be perfectly honest with you. Gee. He came from Redbull. Of course that wing is gonna have the similarity! That was the whole point of poaching Prodromou wasn't it?! @Siddhesh: Yes.... That was the point I was making! SFI is running the same car they brought to Europe. @mfbull: The team really said it has gone in the wrong direction in terms of its aerodynamic development recently. That's coincided with McLaren taking a big step in the right direction. Stevens is now well within 107% but still 1.5s off team-mate Kobayashi. @Nate: Hmmm, can we confirm changes or is no direction maybe also going in the wrong direction? @mfbull: Possibly! Certainly, we are seeing the team's huge lack of resources coming to haunt it at the moment. Kobayashi just two tenths off the Sauber of Sutil after a month without any time behind the wheel.